If you work in data mining, you are every day confronted to terms such as data, information and knowledge. 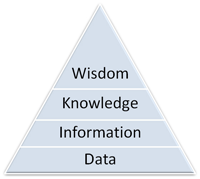 As explained in a previous post on Data Mining Research, there exists a hierarchy on these terms. It is usually represented as shown in the following picture. Don’t hesitate to comment this post if you have a personal opinion on the subject.